Sometimes couples tend to fall into the routines of life, and things within their relationship may start to fizzle or cool down. Instead of going to counseling sessions for couples or worse, couples can look to games as an option for spicing up or even rekindling altogether a relationship that is worth saving. Hundreds of games have been varied or made up new for this specific purpose. Most people might find these games cheesy or embarrassing, but it is important to remember that the fun part of these games is not playing the game itself; it is the interaction with your partner that makes them fun. Besides, if doing these things embarrass you, that is a whole different problem on its own. There are many types of games for all types of couples, yet there are some pretty well known ones that are derived from casino games. We’ll mention here mainly those derived from casino games as well as a couple of the other games. To start off, we’ll mention the most well-known game. This, of course, is Strip Poker. Derived from the one of the oldest casino card games, this game makes mixed poker much more interesting. Instead of losing money, you lose articles of clothing. It’s pretty straight-forward. You can play this way with any version of poker including the ever popular Texas Hold’em. Since this game is so well-known, there isn’t much to explain, but there are some ways unknown to the general public for making the game more interesting than simply playing and removing clothes. Probably the best way is to add punishments for the losers. They don’t have to be dirty if you don’t wish them to be. Players can think of their own punishments, write them on a slip of paper, and put them in a jar; at the end of the game the punished must pick their punishment. For example, you can have the loser, or losers, wait on the rest of the players for the rest of the night while staying naked, or it can be a little more embarrassing like having to answer the door for the pizza guy at the next game completely naked. You can be as creative or cruel as you wish. 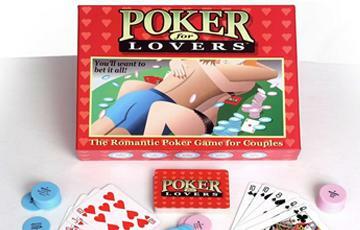 Another game also derived from poker is called Poker for Lovers. This one is a bit more intimate and sexual, but certainly a good one for spicing up the bedroom. It is quite simple, and it comes with everything you need. Each player gets 30 chips; the blue ones go to the man and the pink ones to the woman. Each set of chips is segmented into different actions that must last for at least 1, 2, or 3 minutes. Normal 5-card draw rules apply for antes and playing. The idea behind the betting is that the player must bet the actions they are willing to do for their partner. So, the winner of each hand receives the chips, and the loser must perform ALL the actions that he or she bet. In other words, if the guy loses, he must do all the actions that were on the blue chips for the total time that is added together between all the blue chips that were in play. The game goes on until one wins all the chips, or until you can’t take the heat anymore. Aside from those games, there are always the super-intimate games that take things to the next level. These vary from dice games such as Hot Dice, Around the World in Bed, Passionate Pursuits, and Orgasmixxx. If you search, you shall discover. Make today the day the grey, boring, hum-drum, and normal routine gets a kick in the rear.